The receiver must attempt to ensure that they do not allow the server to gain the initiative. The Squash serve should be varied to prevent an opponent from "getting onto" the serve. The use of wall targets is essential in developing a consistent serve. See below for details. Feet Position and ball toss determine the direction of the swing and hit. The diagram shows the feet positioning from both the right and left service boxes. Ball toss height affects the ability to hit the ball high onto the front wall. Target point - 50 cm from the "outline" on the front wall. Aim to hit the side wall high and behind the back of the service box. 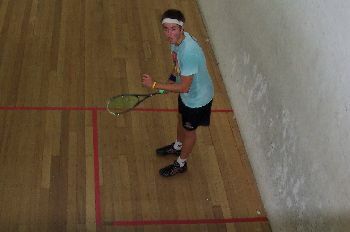 The serve should land within a metre of the back wall. The lob serve is a soft serve which falls or drops into the back corner. Adjust width to suit individual stance and technique. Shoulders point to the target on the front wall. Open racket face gives height on the front wall. Ball toss to be higher than the shoulders so the racket face can get under the ball. A good lob serve will hit the side wall behind the service boxes, before the receiver can intercept it. Try a backhand serve from the forehand side box as a change - remember to adjust the target points. Aim high (about .5 metre) on the front wall about centre of the front wall. Aim two/thirds across the front wall. How effective is my Serve? The power serve is good for a change of tactics. This serve can becomes predictable when served continually. Adjust the target points to counteract the opponent's strengths, eg depending on the position the opponent stands to return the serve. The hard serve resembles the serve of a tennis player. Strike the ball slightly above head height. Toss the ball relatively high and hit through the ball with an open face racket. Aim a racket head above the cut line. Change your target points according to the strengths of your opponent. Try to hit the side wall nick at the back of the service box. Hit it at or behind the opponent as a change (as a surprise). The power serve should always hit the side wall except if aimed at or behind the opponent. Move quickly to the T as your time is limited in comparison to the lob serve. A backhand serve from the right hand service box can be very effective. It can be served as a Power Serve or Lob Serve. The closer the target on the front wall is to the side wall, the lesser the angle of the rebound, making the ball follow closer along the side wall, making the return more difficult to attack. Serving is a closed skill - the server has complete control over the shot including ball toss, racket swing and stance. It is the only case where a consistent technique can be practised, then repeated in a match. It gives the server the opportunity to put the opponent on the defensive. The softer the ball is hit on the serve, the higher the target on the front wall should be. It is important to be able to comfortably hit a lob and hard serve and get to the T quickly after serving. A number of positions can satisfy these criteria. Keeping to the front of the Service box helps get more height on the lob serve and gives the opponent less time to position themselves to return a hard serve. Move with the serve towards the T.
Try to develop a stance and service style which allows either a power serve or a lob serve from the same basic action - this enables the server to disguise the serve. A backhand serve is generally more effective from the forehand service box. Why? As it decreases the angle of the rebound of the ball from the front wall, thus making the ball travel much closer to the side wall. Because the ball is closer to the side wall at around the service box and the person returning the serve has to be ready to move into position earlier, and preferably take the serve before it strikes the side wall. The power serve is very similar to an attacking volley to length. To get the power in the serve the ball toss needs to be about as high as the cutline, which in turn gives the downwards trajectory of the ball. What is an Overhead Serve? Power Serve Rebounds into the middle?